first off, thank you all for the warm welcome to the community! This is probably common knowledge by now, but still rather interesting. "One to rule them all." They're awesome. They transmit video and audio signals simultaneously, saving the need for more cables. Of course, you'll need a computer and TV or monitor that have these connections. All you need now is one of these babes and you're all set for the whole world of 1080p FULL HD. Okay, let's check out Amazon. "Just because I'm cheaper, doesn't mean I'm easy!" That's a nearly 2 meter HDMI cable for 2,3% of the Monster HDMI cable. On Monster's homepage they say that they offer the fastest and most reliable connection, with gold plates, gas-injected cables and shielding from RF and EM interference. These attributes aren't new, they've been around since the old analogue cables for TV. So, with them you would expect a better picture quality then with the cheaper cables, right? Right. If it were still 1990. The explanation for this is simple. Shoddy analogue cables could reduce the quality of your picture, a lot. Be it because copper impurities or unshielded connectors, this could dampen the analogue signal, thusly making you slap your TV. 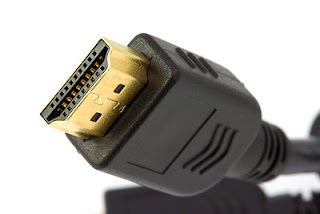 HDMI is not analogue. It transmits its signal purely digital, as in zeros and ones. This means that you either get the signal on your TV or don't. There is no inbetween., no shadowy twilight zone of blurryness. Those gold plaings really do look nice, but they serve no purpose apart from, well, looking nice. "But what about interferences or errors in the signal?" you might ask. Along with the audio and video, it transmits 8 bits of ECC parity data for error correction which describe the packets containing the audio and video. So, why are they still comparativley expensive and still being sold? It's in the markup. Best Buy has a markup of over 4% meaning they'd make roughly $15 selling you a PS3, whereas the markup for HDMI cables is up to 80%! Admittedly, they are made from better polymers and stury connectors. In the bitter end though, it will be the consumers decision on what cable he or she buys. I ONCE KICKED A MAN SQUA IN THE NUTS FOR OFFERING ME AN $80 HDMI CABLE. Heh, you have got to be careful when buying a HDMI cable, I got one for about $15 for my PS3 and it works completely fine. 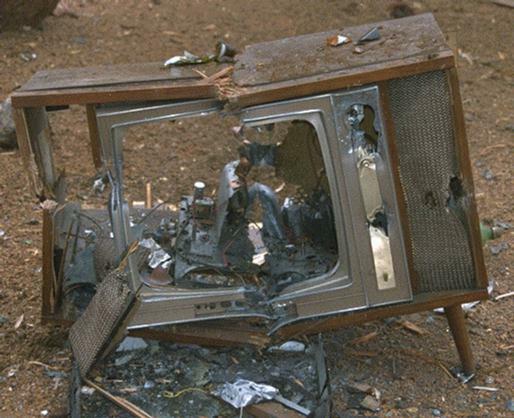 Now thats a messed up TV. I am thinking about getting an HDMI cable soon, thanks for all the info! For some odd reason my Hdtv doesn't have an HDMI. 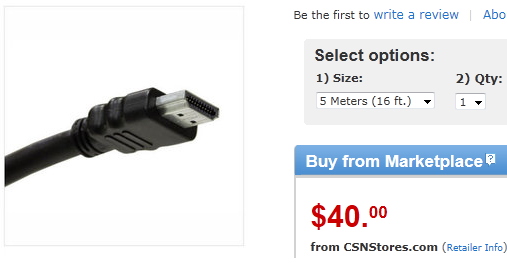 So i was just thinking of getting an HDMI-Component cable and running to my PS3. I've been using $5 HDMI cables for years. They produce a beautiful picture. Same goes for $5 DVI cables. No reason to spend that kind of money on one. Most informative thing I've read today, cheers. Wow! Really good man! Thanks! I love HDMI cabels! Make's things so much simpler. I read an article where they said that this is the biggest scheme of stores with these cables that are marked up like 800 percent...ebay is the way to go. how can companies get away with charging so much for a cable when it is pretty much an identical product. My keyboard has gold-plated mechanical connectors. I don't expect them to react better (except the wonderfull clicking) I just like to be able to brag about it. This was new to me. Thanks for the post! Monster cables at Best Buy are ridiculously expensive, they just prey on people who don't have technical knowledge. Awesome post. I'll keep this in mind when I need to buy an HDMI cable. No more wasting money for me! Honestly though, is there a difference between these cables and places like monoprice? Ich hatte HDMI fuer meine Grossmutters HDTV und mein PS3. Es war schoen. I've tried explaining this to people before and they flat out don't believe it. Oh well.. nice article.